PATTAYA:--Having cleared encroachments around Big Buddha Hill’s Chinese shrine, Pattaya now is trying to figure out what to do with the land. 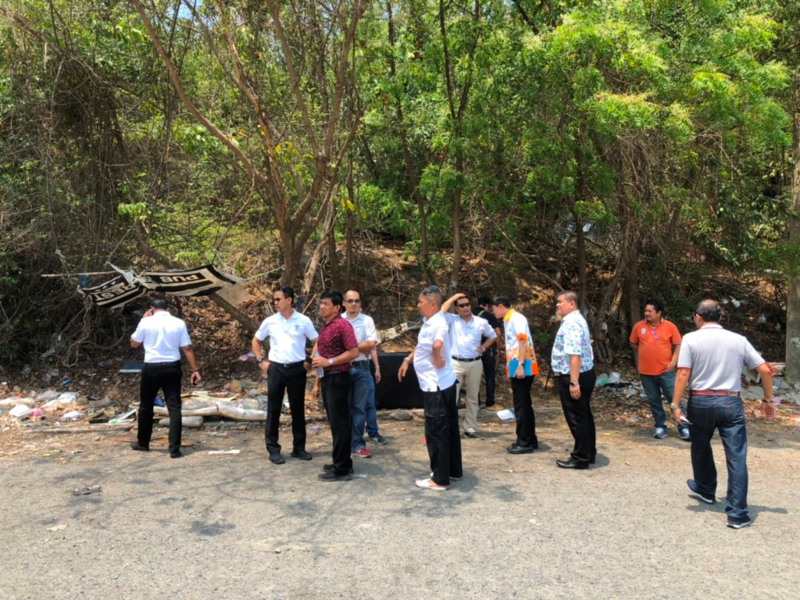 Deputy mayors Manote Nongyai and Pattana Boonsawat toured the Phra Yai Temple area with engineering and public works staffers on Pratamnak Hill March 28 with an eye toward redevelopment of the wat, the Wang Sam Sien Chinese shrine and Attajinda Road. Pattaya was given five rai of Ministry of Defense land from the Royal Thai Navy. After the rights were transferred, Pattaya improved the landscaping but found numerous private ventures had built on part of the land. The city ordered all the structures removed in October 2016. Among them was the popular Wang Sam Sien, built by the Mahakitpaisan Foundation. In July 2016, the Supreme Administrative Court upheld a lower court’s verdict against Mahakitpaisan for building the shrine on public land and gave it to Pattaya. The city originally planned to raze the shrine, but reversed course and will now manage it directly. Now it is looking to beautify landscaping and add facilities to bring more tourists to the area. how about build another big condo block?? not enough of them around Jomtien and Pattaya !! Here you see 11 of Pattaya's finest. The one in black at the rear looks like he is urinating in the undergrowth, and I bet not one of them has given all the filth and squalor we can see a second thought, maybe they haven't even noticed it at all, preferring to concentrate on carving out the best graft opportunities. Put the lot of them together and I bet you couldn't muster one fully functioning brain between them. No wonder this city is such a mess. A string of Family Marts/7-11's/Big C Mini Marts. Oh, and Tesco, too. Great idea I should have thought of all these shops.....we NEED MORE !!! sorting out some adequate car parking would be a start. Hope they clear up the surrounding garbage whilst they are there. No matter what they develop there, TVF posters will find fault. I would love to compliment them on their successes, what are they? Over the years, there have been many improvements to Pattaya city. Meeting your personal approval has never been part of the criteria. So you can't think of any either! And yet there are those whose opinion is that the tunnel has improved traffic flow at that junction.